This photo shows the start of the project. Hidden inside that tangle of willow trees is a pond. I should mention that due to this years drought all of the ponds on Arington Tree farm are at low levels. 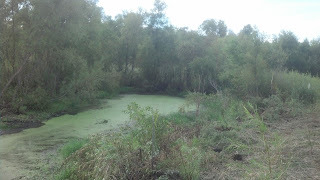 This pond, along with a similar sized one right behind it, need to be surveyed. After the survey is complete we hope to be given a permit to have them excavated. Both of the ponds are in a wetland area where Mudd Creek used to flow. 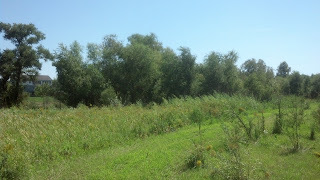 However before a permit can be issued or a survey completed the willows needed to be removed. And here is a photo with half of the willows gone and the hidden pond revealed. I used two methods for the willow removal. The first was using our Bobcat mini excavator to pull the willows out. I had high hopes for this method. However, the ground is so dry that the trees didn't come out cleanly. The trunks were breaking off, leaving the roots behind. Those roots would surely sprout back in the spring. My next approach is what I will finish with. I am using a tree shear with our Bobcat skid steer. After cutting the willows with the shear, I am stump treating with a Garlon 4 and diesel oil mixture. This will prevent any resprout. Stay tuned for an action photo and a completed project photo.